Eyes on Pennsylvania's 197th District - Will corruption prevail? | No More Stolen Elections! Eyes on Pennsylvania's 197th District - Will corruption prevail? The fight to democratize elections in this country includes all areas of political life - from national battles to local ones. Brave individuals in every corner of this country must continue to attempt to represent the people and their interests by running honest campaigns and demanding justice when those campaigns culminate in stolen elections. 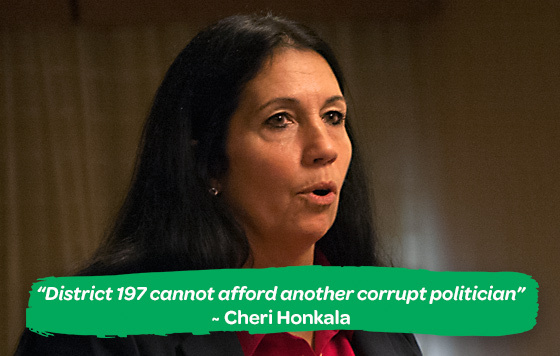 This week, we shine a light on Cheri Honkala, who is about to begin federal court proceedings over the outcome of the hotly contested run-off election for State Representative of Pennsylvania's 197th District in which she was a write-in Green Party candidate. The seat in the 197th was vacant due to the resignation of State Representative Leslie Acosta after secretly pleading guilty to a federal felony charge of conspiracy to commit money laundering. The Pennsylvania Green Party is presenting evidence in federal court on September 14, 2017 supporting allegations that the Democratic Party candidate Emilio Vasquez was victorious due to a variety of illegal activities including voter intimidation, ballot tampering and providing misinformation to voters at the polls - they are requesting a new election. Below you will find a note from her campaign addressed to the community affected by the recent election, as well as articles helping explain the current situation on the ground in Philadelphia including the types of election fraud and intimidation encountered by voters. - No More Stolen Elections! You voted for your Candidate! But you were not given the right to welcome that candidate into office. Instead, you got a candidate who clearly cheated, and who does NOT have the backing and support of our community. The time has come. We are at a historic crossroads. Will we break the cycle of corruption that the 197 community has been plagued with for years, or will we allow the corrupt machine to continue destroying our community? Former State Representative Leslie Acosta, after secretly pleading guilty to a federal felony charge in March 2016, resigned and then hand selected her replacement, Frederick Ramirez. This is the second Democrat in a row to resign because of corruption. J.P. Miranda, the representative prior to Acosta, pleaded guilty to having a “ghost employee” on the payroll. Even after all this corruption was exposed, the political machine still blatantly condoned and helped facilitate voter intimidation and fraud on March 21, 2017. There are dozens of documented stories detailing how the political machine stole this election through unfair and outright illegal tactics. People were told they could not vote for Cheri. Tables were set up outside with the opponent's literature made to look like the voter sign-in table. Some tables inside the polling place gave out literature and stamps of the opponent. Election workers asked people who they were voting for. Voters were asked if they were sure they wanted to vote for Cheri. Election officials tried to convince voters to vote for her opponent and told them that they had the wrong write-in stamp and proceeded to give them the stamp of Mr. Vazquez. We have video of election officials taking money. There are reports of people being paid for their vote. There is even a photograph of the ballot box at the end of the night at the opponent's so-called "victory party" -- held 3 days before the votes were to be counted! Many of us know that politics are corrupt in Philadelphia, and sadly, many of us have come to accept it as we thought we had no other option. Cheri ran an honest campaign and that obvious corruption is a slap in the face to everyone who lives in the district. Cheri is asking you to join her in federal court to fight to put an end to this legacy of corruption on September 14th, 2017 at 3:00 pm at the Federal Court House located at 601 Market Street in Philadelphia. Cheri Honkala will continue to advocate for the dignity and basic human rights of each of her constituents in District 197 including: housing, food, healthcare, social justice, quality education, sanctuary for immigrants, a living wage, environmental justice, an end to the school-to-prison pipeline, an end to misleading student debt proposals that take advantage of our “Dreamers”, our youth regardless of documentation, and a world that is accessible for all people, with or without disability. If our elections are tainted and can be swayed or stolen by the establishment machine, then the people cannot fairly choose who they want to represent them. The people of the 197th district have been represented by two felons in a row. Please help give them a chance to not be represented by a third who engaged in tactics of voter intimidation and fraud to win. Please help stop this legacy of corruption in the poorest district in Pennsylvania. Together, we can stop the corrupt machine.